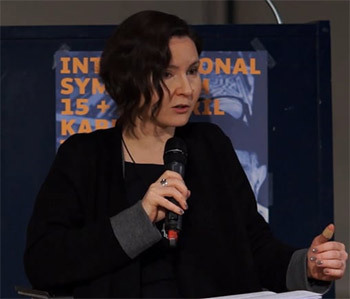 Katerina Krtilova is a researcher and coordinator of the Kompetenzzentrum Medienanthropologie (Competence Center for Media Anthropology) at Bauhaus-Universität Weimar. In 2016 she finished her dissertation on Vilém Flusser’s media philosophy at Bauhaus-Universität Weimar. In her research she focuses on media philosophy, European media theory and the relations between reflexivity, performativity and materiality in 20th century philosophy. She initiated a number of German-Czech projects in the field of media theory and philosophy, 2013/2014 the DFG funded research project Positions and Perspectives of German and Czech Media Philosophy, 2016 together with Kateřina Svatoňová the research group Teorie/filosofie médií (Media theory/philosophy) at the Faculty of Arts, Charles University Prague. Recent publications: Medienwissenschaft. Východiska a aktuální pozice německé filosofie a teorie médií (ed. together with Kateřina Svatoňová), Praha: Academia 2016; „Medienreflexiv. Zur Genese eines Verfahrens zwischen Martin Heidegger und Vilém Flusser“, in: Internationales Jahrbuch für Medienphilosophie 1/2015; „Technisches Begreifen. Von ‚undinglichen Informationen‘ zu tangible interfaces“, in: Jörg Sternagel, Fabian Goppelsröder (ed. ), Techniken des Leibes, Weilerswist-Metternich: Velbrück 2016; „Media matter. Materiality and Performativity in Media Theory”, in: Bernd Herzogenrath (ed. ), Media | Matter. London/New York 2015. The article questions Flusser’s concept of the computational universe based on technical images. Emphasizing the role of the calculative, formal consciousness the article suggests a non-representational, non-hermeneutical approach to “calculating machines” as machines that allow to mechanize a certain type of thinking (mathematical thinking). At the same time, the article reformulates Flusser’s search for a new philosophy as a critical intervention into the programmed universe, arguing that this philosophy must not follow its technical logic, but find a way to reflect how different techniques and practices shape the numerical, imaginative and textual consciousness.